"Destiny isn't a path any cat follows blindly, it is always a matter of choice and sometimes the heart speaks louder. Always listen to your heart, because that is where your true destiny lies"
Does it yearn to live in the mountains among the tribal warriors or down in the forest fighting along side StarClan? Do you hear whispers at night while you're snugger than a bug in a rug? Join Twlights' Eclipse, an up and coming Warrior cat roleplay. Create your own character and join in on the fun! 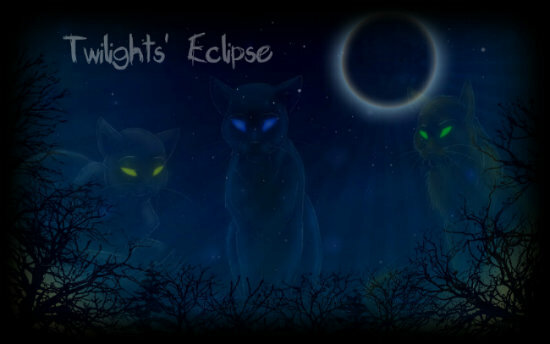 StormClan, BrambleClan, IvyClan and the Tribe of Silent Dreams call out to you! Find your destiny among these cats, fight for your survival, your family, and the truth. Make friends, foes, and start a family but always remain loyal to those you love. I did not see a master list anywhere, but I wanted to go ahead and post the sites I advertised on. Sunflame said you guys were hurtin' for activity. I hope this helps.